Maps are a good way to learn what is happening in the world at a glance. 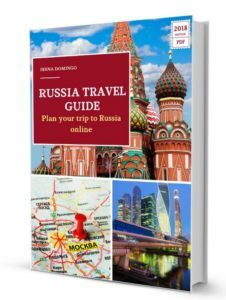 In this post I have selected the best 15 maps that can give you a better insight of Russia and to discover very specific and curious aspects of the country. Note: below each map you will find the source from which it comes, if you’d like to know more information and investigate the statistical source that is being used. Mainly, I have classified the maps into 6 themes: economy, population, corruption, religion, health and others. The first map refers to the cost of living in Russia, in order to know, comparatively speaking, whether it is an expensive or economic country. Well, considering the data from the 2016 Numbeo database and calculating the cost of living as an index, it can’t be said that Russia is an expensive country. On the contrary, the ruble devaluation and the economic crisis has meant that the cost of living has fallen comparatively, when compared to other countries. For example, if you need to travel to Germany for 5 days (index 100), you need 1,000 euros (to cover accommodation, food, goods and services), to travel to Russia (index with value 62) you would have to spend 620 euros during these 5 days to maintain the same quality of life. 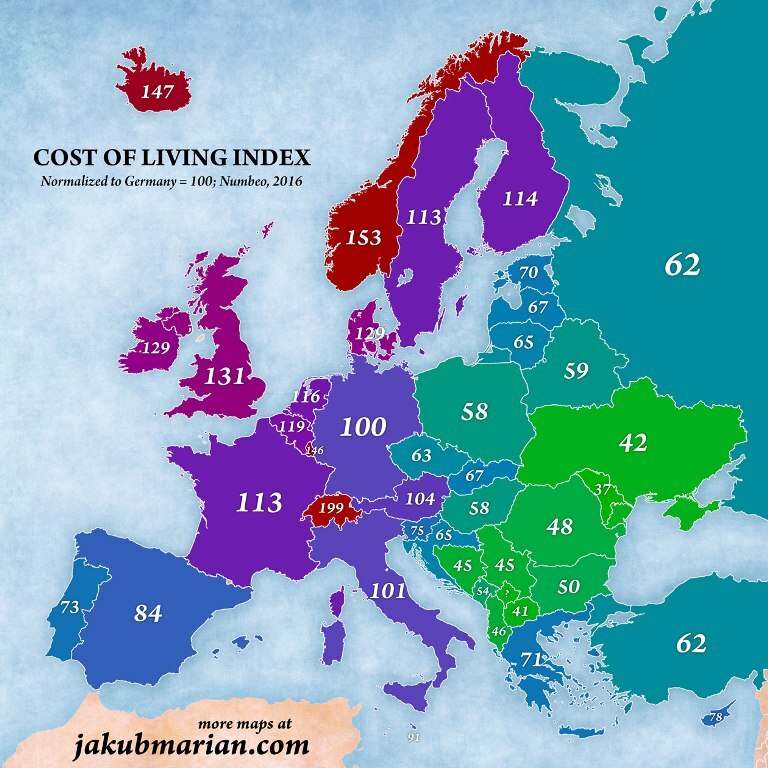 In Spain, (index 84), you would need to spend 840 euros, and in Switzerland (index 199), a total of 1,990 euros. According to these data, the standard of living in Russia is similar to what you can find, for example, in the Czech Republic or in Croatia. According to data of Gazprom, the Russian gas company, Russia exported 146.6 billion cubic meters during 2014 of natural gas to countries that are not part of the former Soviet Union. As you can see on the map, gas represents a very significant amount of its energy consumption for some European countries. 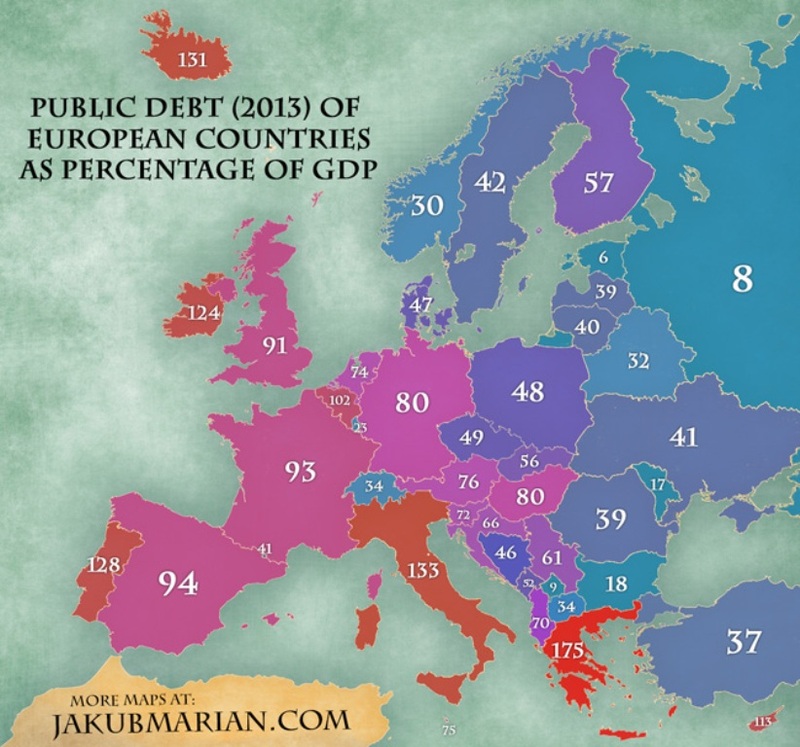 If we look at the public debt data by country, with regards to GDP, we have found that Russia is one of the European countries with the lowest public debt in relation of GDP (8% in 2013). In Western countries, people tend to live beyond their means and they get into greater debt. As for military spending, things change since in Russia it represents 5.39% of GDP (467 dollars per inhabitant), the highest figure in Europe. In the USA, for example, military spending is 3.3% of GDP, but it is 1,854 dollars per inhabitant. Russian population is around 144 million inhabitants. 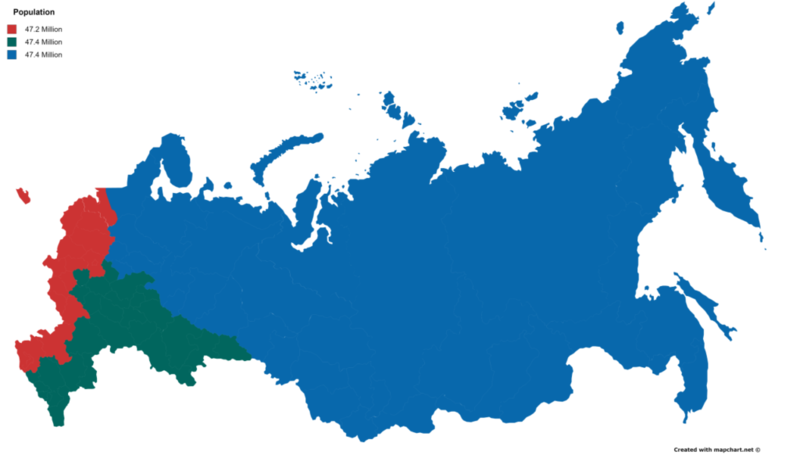 The following map shows the map of Russia divided into three parts with equal population. I think this is self-explanatory. It is estimated that there are 101.8 men per 100 women in the world; however, the latest UN data shows that men and women are distributed unequally throughout the world. In Russia and in the former Soviet republics, women outnumber men (between 85 and 90 men for every 100 women). On the contrary, there are more men than women in Asia, in Arab countries and in North Africa. The following map shows which is the second nationality in importance in each country. 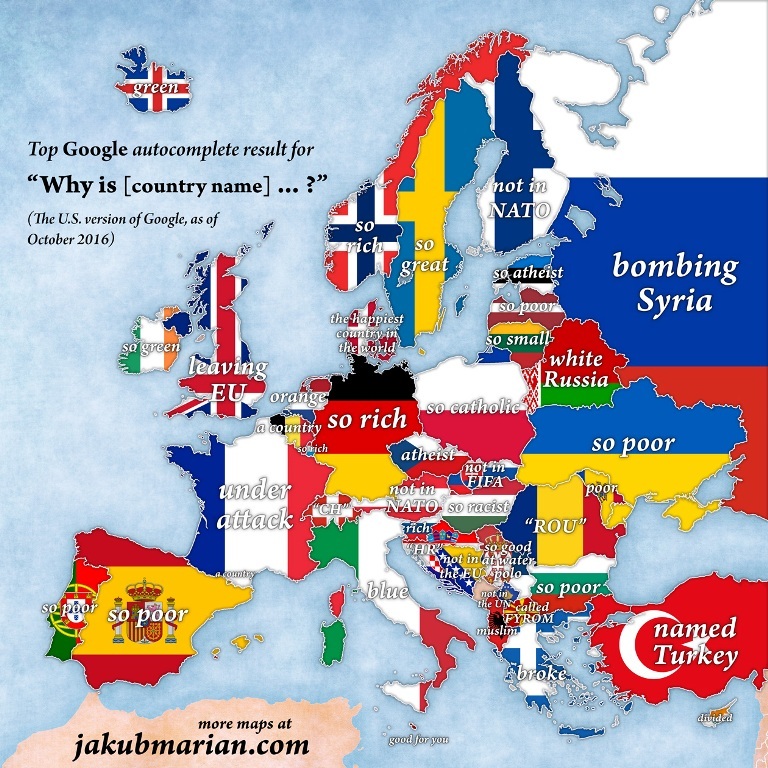 Well, in Russia the second most important nationality is the Ukrainian. 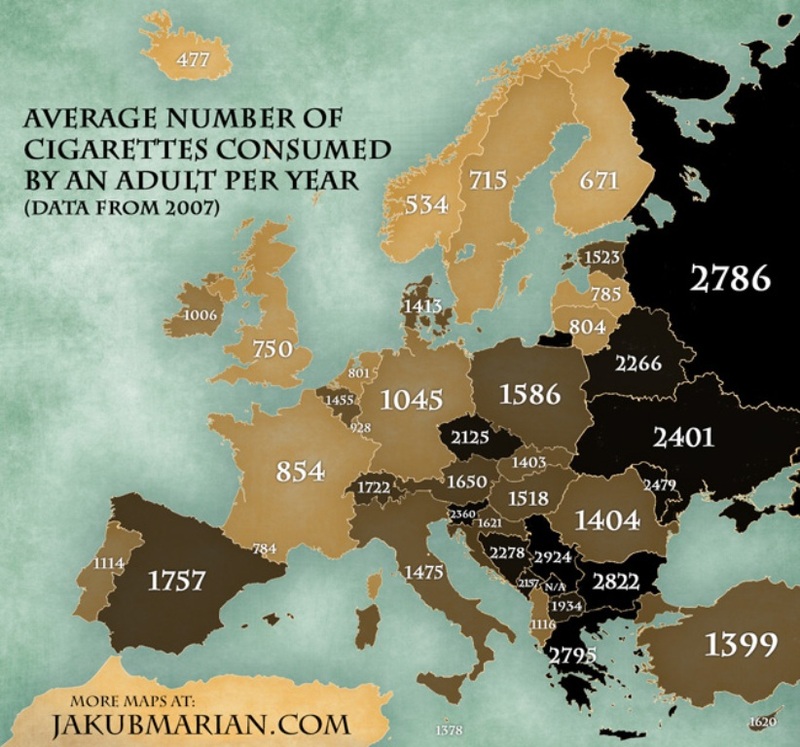 Also, the Russians are the second most important community in Ukraine, Belarus, Latvia and Estonia. The most common surname in Russia is Smirnov (or Smirnova, in feminine), which means quiet. This surname is the origin name, for example, of Smirnoff, the Russian vodka (a transliteration of Smirnov), created in 1864 by Piotr Arsenieyevich Smirnov, which is the best-selling vodka brand all over the world (it is currently owned by Diageo, the multinational corporation). Other popular surnames in Russia are Ivanov (most common surname in Belarus), Kuznetsov, Popov, Sokolov, Lebedev, Kozlov, Novikov, Morozov and Petrov. 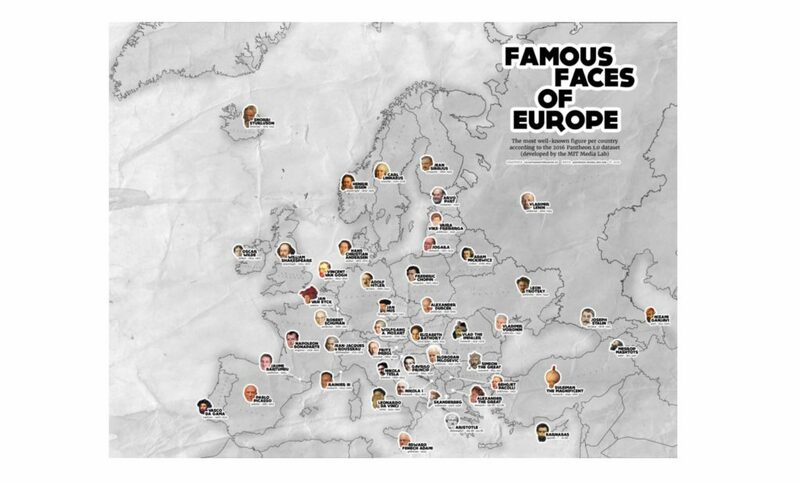 In the following map you can see the most famous faces of Europe, and countries of the former Soviet Union. In Russia, Lenin’s face is the most famous. Stalin’s face also appears on the map because he was born in Georgia. The Constitution of Russia states that the country is a secular State, though the Law on Religion of the Russian Parliament of 1997 states that the four traditional religions are the Russian Orthodox Church, Islam, Buddhism (mainly Lamaist) and Judaism. 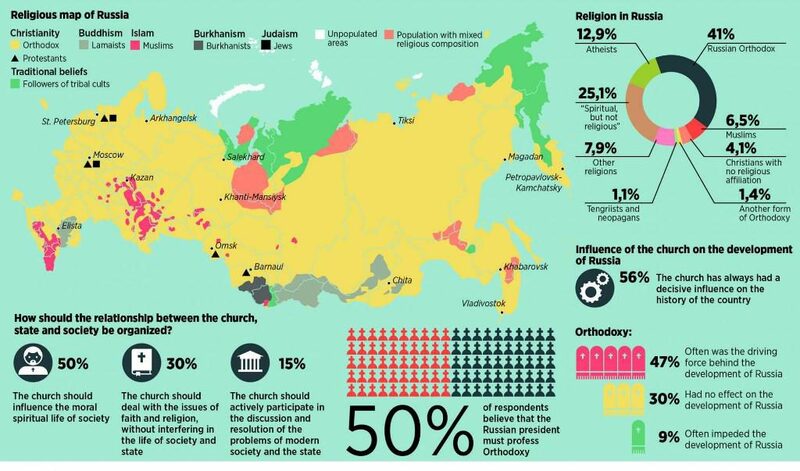 The majority religion is Orthodox, though it must be considered that Russia is one of the countries with the largest number of atheists and agnostics in the world, something influenced by the fact of having been a socialist state. 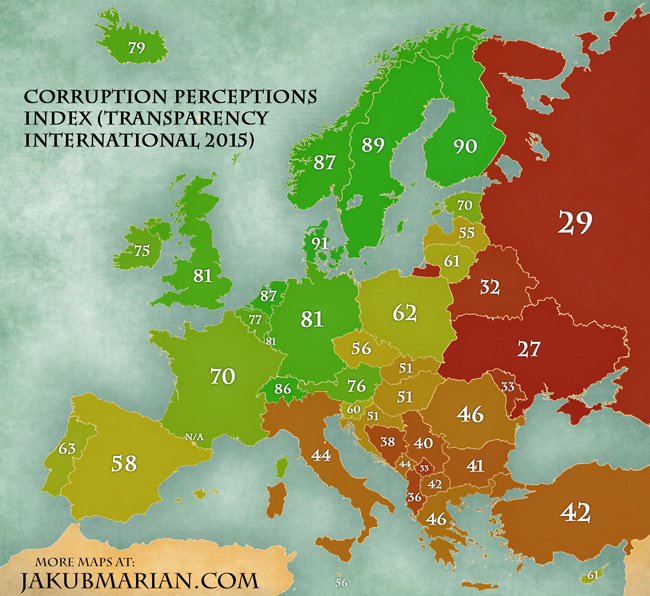 According to Transparency International’s 2015 Corruption Perceptions Index, Russia has one of the lowest scores, which means it is perceived as one of the most corrupt countries, in terms of the public sector. Only Ukraine has a lower score. Life expectancy at birth in Russia is 70 ½ years old, well below the EU countries. There are many factors that can influence life expectancy, such as the health system, lifestyle, eating habits, wealth, and many others. However, this figure hides the inequality between women and men: if Russian women have a life expectancy slightly above 75 years, Russian men don’t reach 65 years old. Smoking or alcohol consumption is related to life expectancy. 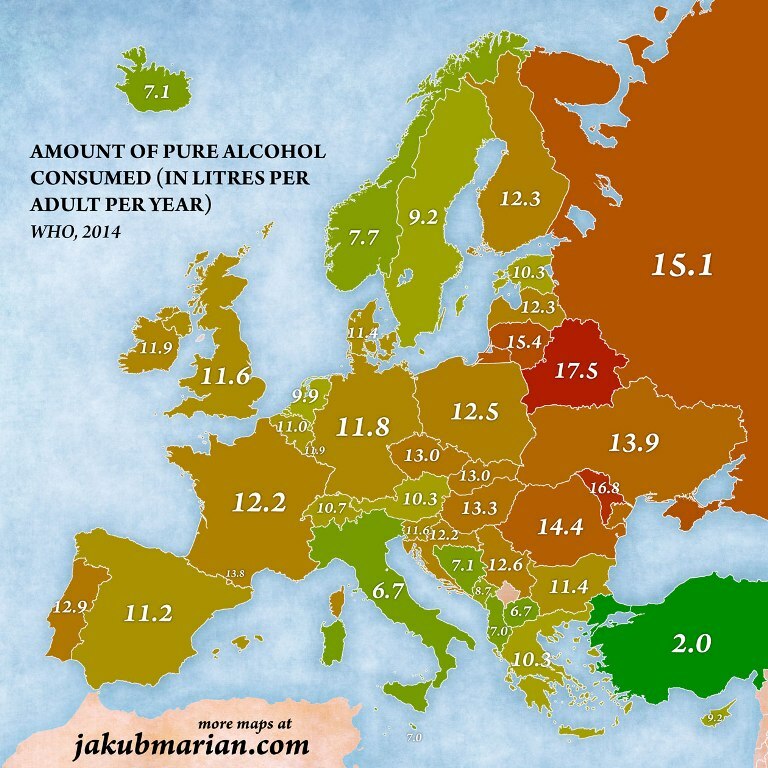 Well, Russia is one of the countries with the most smokers in the world, with an average annual consumption per adult of 2,786 cigarettes, and also with a high consumption of alcohol, with about 15 liters per adult per year, especially vodka and beer. 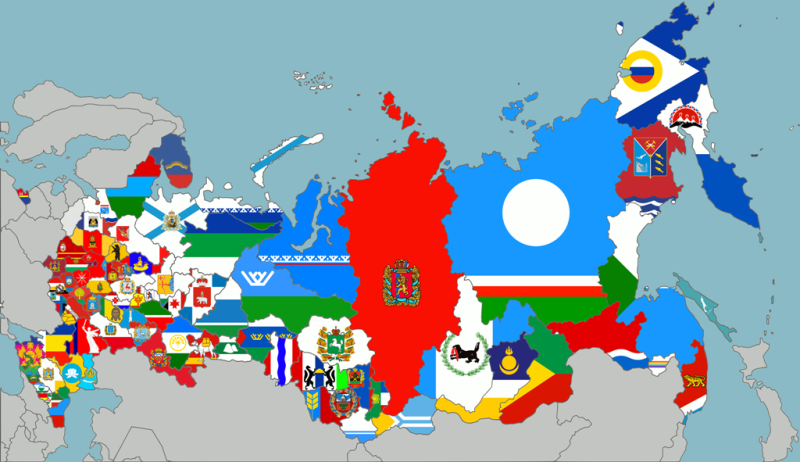 Why Russia is so big? Why Russia is so powerful?